A federal appeals court judge, who as a government lawyer signed off on secret memos authorizing the use of the torture technique known as waterboarding against terrorism suspects, received $3.4 million in free legal services while successfully fending off ethics charges over the authorization. 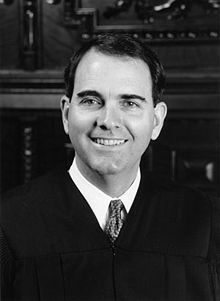 Jay Bybee, now a member of the San Francisco-based 9th U.S. Circuit Court of Appeals, headed the Justice Department’s Office of Legal Counsel and signed off on memorandums authorizing waterboarding, internationally recognized as torture, and harsh interrogations in the wake of 9/11. Bybee worked in the office from November 2001 to March 2003, supervising the memos’ controversial author John Yoo. In 2003, President George W. Bush appointed Bybee to the appeals court. Despite the elevation of Bybee, the DoJ’s Office of Professional Responsibility opened an investigation in 2004, looking into whether to file professional misconduct charges against him for providing legal cover for the use of torture against terrorism suspects, including Khalid Sheikh Mohammed, the alleged mastermind of 9/11. But, thanks to the help of Los Angeles firm of Latham & Watkins, the investigation was dropped in 2010. The National Law Journal on Monday published Bybee’s financial disclosure statements for the 9th Circuit,. They show that Latham had donated $3.25 million in services and a few other firms another $150,000 in the years leading up to the government’s decision concluding that Bybee and underling Yoo had not committed professional misconduct. The episode continues to affect Bybee’s role as a judge because of potential conflict of interests involving Latham. The firm has a major presence in the 9th Circuit, but a search of court records shows that, since Bybee’s troubles began, he has disqualified himself from cases in which Latham lawyers are representing a client.